An efficient and affordable photovoltaic (PV) solar cell made of readily available natural materials was developed by team comprising IBM’s Materials Science and Japanese company, Solar Frontier. “Tests of our Cu2ZnSn(S,Se)4 (made of readily available copper, zinc, and tin, and referred to as CZTS) thin-film devices have achieved a world-record PV solar-to-electric power conversion efficiency of 11.1% (10% better than any previous reports) for this class of semiconductors, say IBM Research photovoltaic scientists Teodor Todorov and David Mitzi. And it can be manufactured by simple ink-based techniques such as printing or casting. Currently, the most widespread PV semiconductors, made of crystalline silicon, are abundant and highly efficient. They’re in panels used for everything from home electricity to the International Space Station. However, they have extremely high material purity requirements (>99.9999%), and the wafers are typically cut from large solid ingots and wired in series to form PV modules — making it expensive and difficult to upscale. Other thin-film chalcogenide materials used in PV cells, such as Cu(In,Ga)(SSe)2 (CIGS) and CdTe, have been developed to a performance level close to that of silicon, with inherently more scalable processing, the scientists say. They are directly deposited on large-area, low-cost substrates such as glass, metal or plastic foil. But their compounds contain rare and expensive elements that increase cost and limit their manufacturing levels to less than 100GW per year (worldwide continuous electricity consumption is 15 Terawatts — 150 times greater than the level of what these CIGS can produce). 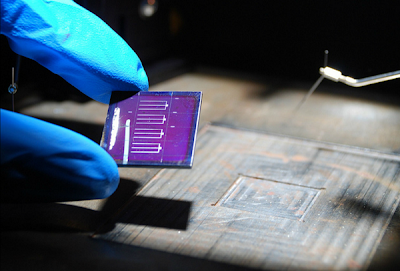 They hope that within several years this new class of photovoltaic materials will begin to contribute to the wider availability of lower-cost solar electricity. TheGreenMechanics: Moving ahead for the better. With more and more breakthrough on finding cheaper and more efficient solar cell, let's hope that we wouldn't have to resort to nuclear power in the distant future.